Students draw a picture and write about what they want to be when they grow up and why. 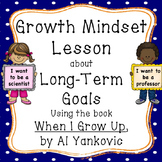 There is an adorable book by Al Yankovic called "When I Grow Up" that I like to read before students complete the activity. It's a great text-to-self connection activity that aligns with the Common Core. A quick and easy activity for lower years. I created this worksheet activity to go with the book "I Wanna Be Famous" by Bruce Whatley.Just print and go! Thanks for the download. Enjoy! 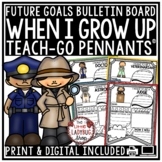 WHAT DO I WANT TO BE WHEN I GROW UP WORKSHEET! Give you students the opportunity to explore their desired profession ! Great to use when discussing economics with younger students. This growth mindset lesson is about setting long term life goals. It is never too early to help our student to think about their futures. This lesson uses a really fun book written by Al Yankovic (yes, Weird Al), called "When I Grow Up". This is a great rhyming book that will enchant all listeners. 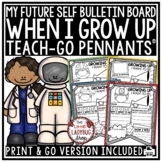 This is the perfect graphic organizer with writing paper to go along with a writing about what students want to be when they grow up. 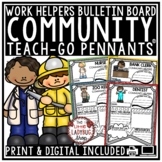 Community Workers ~ "When I Grow Up"
Simple writing activity for students to complete. -Question: "What do you want to be when you grow up?" Space for student drawing too! Jobs/Occupations ~ When I Grow Up! Create this adorable book by cutting 8 pages in half and putting the right side, on the back then stapling it on the top! Students will fill in the beginning sound of 14 different occupations and then on the last page they will brainstorm what they want to be when they grow up! Simply adorable!